To learn more about us, you can read our Constitution and our Bylaws. Feel free to download our colorful brochure in PDF format. In the 150-year-long history of Salem State College there have been many worthwhile clubs and groups, but this never included a Peace Club. This is the story of how a group of faculty members and students addressed this deficiency in the Fall of 2006. 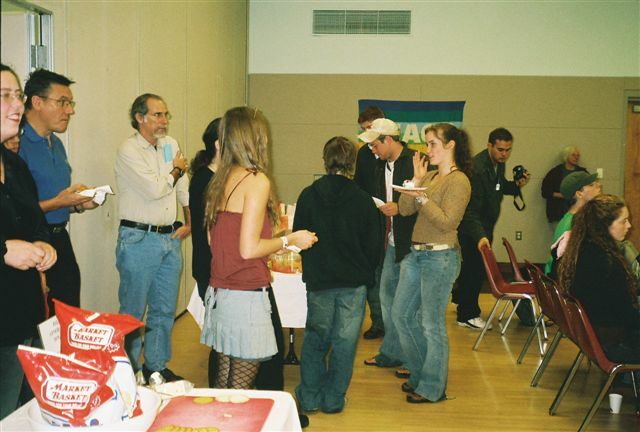 The first official meeting to found Students of Salem for Peace (SOS for Peace) was held on September 20, 2006, but the actual seeds for this group were planted on September 11. These seeds were in the form of the optimism and heartfelt convictions of David Stewart, Randy Holmberg, Anthony Kruchas, Matt Klein, and Jen Jordan. At the College Clubs fair that crisp autumn day, they enthusiastically signed up to be placed on the listserv of the Peace Institute. 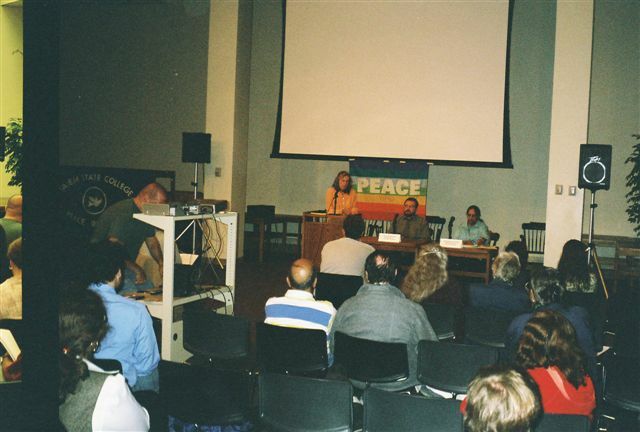 Later that evening, these same students attended a 9/11 commemoration titled "The100th Anniversary of Gandhi's Struggle for Nonviolence" in Forten Hall. There we showed excerpts from the Gandhi movie with Ben Kinglsey and a special DVD made for the occasion - "Satyagraha: 100 Years of Nonviolence." Professors Krishna Mallick and James Hoover led a discussion on nonviolence. Realizing there was heightened interest in peace in Fall 2006, I visited Professor Krishna Mallick's "Alternatives to Violence" class to ask the 15 students enrolled if any of them would be interested in starting a Peace Club. Three students - Jennifer Gange, Jennifer Etheridge, and Lisa Giammanco signed up. Offering to help publicize the first meeting, they made a beautiful flyer. That flyer then led to our first meeting. We discussed procedures for forming a new club and how to work with the Log. Then we realized the next day, September 21, was International Day of Peace, and we spontaneously decided to hold a peace festival in the courtyard in front of Ellison Center. We lined up flags, face paint, yarn for braiding, signs, and music. Working together for this festival brought us together. We all pitched in. Many students came by our table in front of Ellison Center to get their faces painted. Creatively working exceptionally hard that day, Sarah Lopez painted many faces, braided people's hair with yarn, and taught others how to do these crafts. David Stewart held a sign Make Love, Not War and played music. We wanted to lift everyone, including ourselves, to love, compassion, and higher ideals. Our next meeting on September 27, 2006 brought us nearer our goals as we discussed possible names for the club, the mission statement, the Credo, and the Constitution. Randy Holmberg volunteered to be Secretary and recorded the first minutes. Diana Emmons attended our next meeting Oct. 4th and suggested the fantastic name, Students of Salem for Peace, SOS for Peace. David Stewart suggested the wonderful Credo. We decided to hold a Speak Out on October 17, 2006 and began planning for it. Randy Holmberg made a beautiful publicity flyer for our Speak Out on Oct. 17. Mikaela Ferland made the first 3-fold brochure which had the club logo on the front and mission statement, credo, and peace quotes inside. She did a most professional and creative job on it. Our first major event was a Speak Out held October 17 at which Diana Emmons MC'd. She told the story of her experiences as an EMT in New York City on the day after 9/11. We all recalled that terrible tragedy which Diana made so real to us. Other students spoke out, Mamadou and 3AD played the drums, and everyone danced. David Stewart sang two songs. Coffee Time, Omega Pizza, Engine Room, and Dunkin Donuts donated food and drinks and Banville Optical gave the raffle prize, a pair of sunglasses, which Chad O'Connor won. It was remarkable how generous people were and how glad they were to support our club. We turned in the Constitution on October 20, one month after our September 20 founding. I want to especially thank and acknowledge Rebecca Miller and Chad O'Connor for their help with writing the Mission Statement. 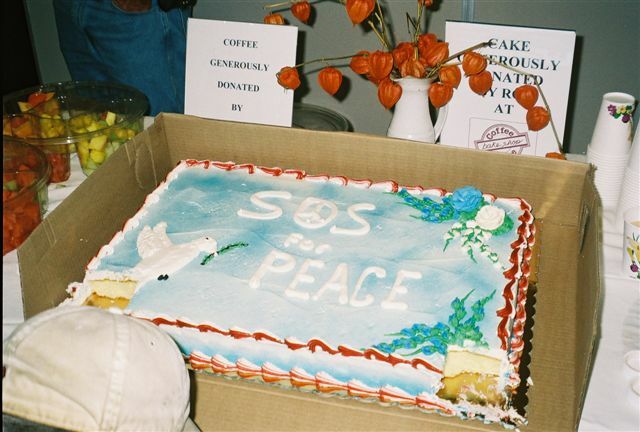 Professor Jon Aske added the SOS link to the Peace Institute website on Oct. 20. Since Peace is an issue that crosses all cultures and has implications in all academic disciplines we foresee co-sponsoring many events with other groups, groups within Salem State College and groups in other colleges and universities in the Boston area. We plan to start purchasing bulk, low-cost peace buttons and tee shirts so we can sell them for a small profit and send the money to worthy causes to ease poverty and disease.